All through these lectures, this person set up ‘straw men’ in an attempt to discredit those who believe in six ordinary days of creation, a global (entire globe) Flood, no death, disease and suffering of the nephesh animals before sin, and a young age for the universe. The cat types today have developed by natural and artificial selection acting on the original variety in the information (genes) of the original cats, resulting in differing combinations of information, including speciation.7 Thus only a few ‘cat’ pairs may have been needed on Noah’s Ark. Teachers have a great influence on students. Imagine how these students (and faculty) have probably been immunized against straightforward biblical creation by such misleading tactics. ‘… the leaders of young earth creationism, as non-Christians were evolutionists, whereas the leaders of old earth creationism, as non-Christians, were anti-evolutionists.’1 How can he make such an absolute statement? I am one of the leaders of two of the largest creation organizations in the world.8 I was brought up in a Christian home by a father and mother who stood solidly on the authority of the Word of God. I never believed in evolution. My motivation for being involved in creation ministry came from a deep desire to teach and defend the authority of the Bible. ‘If you look at the history of the young earth creationist movement, it really flows out of a flood geology by George MacCready Price … . The young earth doctrine flows out of that attempt to interpret the flood in that context …’.1 When I first became involved in the founding of the creation movement in Australia some 20 years ago, I had never heard of George MacCready Price. The reason I was a ‘young earth creationist’ was for theological reasons—since there was no death, bloodshed, disease or suffering before Adam sinned, there cannot be a fossil record millions of years before sin.9 This has always been my emphasis—what the Bible teaches must judge man’s opinions, not the other way round. ‘I hear there’s over a hundred separate arguments that are claimed to be evidences for a young earth, for a young universe. But we’ll be happy to show you the bogus nature of these claims.’1 Ultimately, the reason biblical creationists believe in a young earth is because of Scripture—not evidences outside of Scripture. Accepting the days of creation as ordinary days, and adding up all the dates in Scripture (even allowing for possible ‘gaps’ in the genealogies) gives an age of several thousand years. However, biblical creationists have shown that, using the same assumptions as evolutionists do for dating methods that give results of billions of years, there are many methods that give dates far younger than evolutionists require. Respected physicist Dr Russell Humphreys claims this for 90% of all dating methods.10All dating methods require unprovable assumptions; there are no infallible dating methods outside of Scripture! ‘As you notice in the text, Adam and Eve are eating plants before they sinned, and so plant parts at the minimum were dying, before Adam sinned.’1 The speaker here is trying to refute the teaching of the biblical creationists that there was no death, bloodshed, disease or suffering of animals or man before sin. However, the students are not being told that there is a theological distinction given in Genesis chapter 1 between man and the animals (described as having a nephesh (life principle)), and plants (which haven’t). God gave plants for food originally (Genesis 1:29–30), as plants are not ‘living’ in the sense that animals are. Sadly, this sort of teaching to discredit biblical creation is prevalent in churches, Christian colleges, and seminaries today. I have often asked the Lord in prayer why He allows impressionable students to be led astray like this. The Israelites were told that certain people would say and do things that seemed right and thus confirm that what has been said must be from the Lord. However, no matter what the experience, or how wonderful the message sounded, the Lord was testing them to see if they were prepared to take Him at His Word. If it contradicted the clear Word of God that had been given to the people, they were not to accept it, no matter how ‘great’ it seemed. There surely seems to be a famine of the Word of God today—people would rather listen to the words of fallible men. How we need to ‘Hear the Word of the Lord’ and ‘tremble at his word;’ (Isaiah 66:5). E.g. a book by a leading Australian humanist ridiculed the idea of Noah’s Flood by indicating that creationists believe that Noah needed aquariums for all the fish, and that whales had to ‘flop’ up the gangplank! Creation16(3):22–3, 1994; 19(1):42–43, 1996; CEN Technical Journal9(2):140–141, 1995; 9(2):142–143, 1995; 10(1):128–167, 1996; 10(2):258–278, 1996. Steven A. Austin, Grand Canyon: Monument to Catastrophe, Institute for Creation Research, Santee, California. pp. 57–82, 1994. John Woodmorappe, Noah’s Ark: A Feasibility Study, Institute for Creation Research, pp. 3–13, 1996. Also Jonathan Sarfati, How did all the animals fit on Noah’s Ark?Creation 19(2):16–19, 1997. Gary E. Parker, Creation: The Facts of Life, Master Books, Green Forest, Ark, pp. 112–115, 1996. This is not ‘evolution’, since it is based strictly on the created information already present, and is thus limited. Evolution from ameba to man requires new information to arise by natural processes. Put another way—one involves thinning of gene pools, the other an expansion. They are certainly not the same. Answers in Genesis in the U.S. and Creation Science Foundation Ltd. in Australia [now Creation Ministries International]. Did Adam understand what death was? Creation8(4):29–32, 1986; Why did God impose the death penalty for sin? Creation15(1):32–34, 1992. 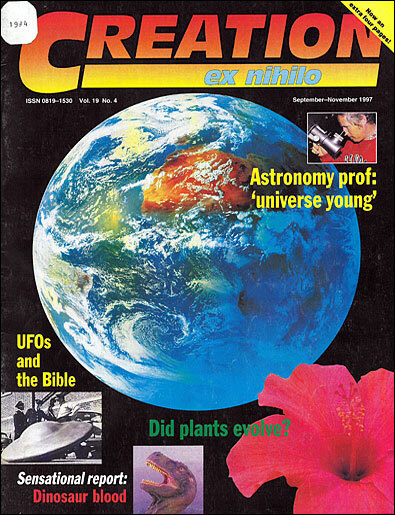 K. Ham, A. Snelling, C. Wieland, The Answers Book, Creation Science Foundation, Qld, Australia, Chapter 7, 1996. The same lecturer also told students that the Flood could not be worldwide, because of the ‘limited extent of sin’. Since penguins in Antarctica had not yet had any contact with sinful humanity, God, he said, would not have killed off penguins. Of course, there are penguins in parts of the world without ice and snow, but more importantly, Romans 8:22 states: ‘For we know that the whole creation groaneth and travaileth in pain together until now’. Adam’s sin affected everything, everywhere in the universe. See our pamphlet ‘Six Days? Honestly!’ Also Creation19(1):23–25, 1996.